A unicompartment knee replacement (UKR), also known as a partial knee replacement is designed to replace the worn surfaces of the knee joint. This is done using a metal and plastic device fitted onto the surfaces of the femur and tibia. Some bone is removed to allow the implant to fit correctly. The implant is fixed either with cement or by allowing bone to grow into it. 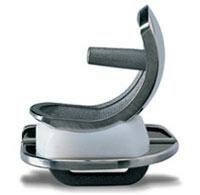 Unlike total knee replacement, an UKR replaces only one side of the knee joint. This enables the other compartment and all ligaments to remain intact. By retaining all of the undamaged parts, the joint may bend better and function more naturally. However, not all patients are candidates for UKR. In most situations a patient will only be suitable if the arthritis is isolated to the medial compartment ( inner side ) of the knee, the ligaments are intact and the knee bends well. The operation is usually performed under a general or spinal anaesthetic. It requires an incision over the front of the knee, releasing some of the muscles around the knee to expose the joint surface. Most patients spend 3 to 5 days in hospital. – Arthritis is other areas of the knee. Overall the chances of a UKR lasting greater than 10 yrs is about 85%. If an UKR fails a total knee replacement can be performed. Day 2 – 4: Mobility exercises, walking, stairs. each day till performing most daily activities with help. Going Home : This should be planned before coming to hospital. To keep this information with you, you can download the PDFhere.